Looking for the best David Attenborough voice impression? An authentic wildlife explorer? This sound-a-like has been heard in almost as many places as the legend himself has visited. Side note, Guy is also the busiest Voice of Santa. Need a Father Christmas? A rare species able to imitate. 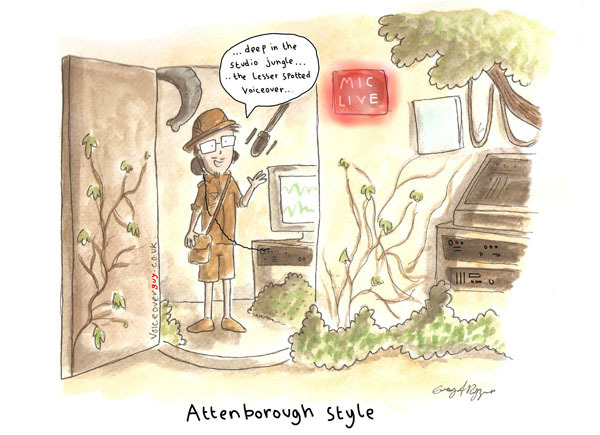 Have you searched through the deepest darkest jungles to find a David Attenborough sound-a-like voice? Or just Google? As heard on TV & Radio worldwide. Across the plains of Africa all from a remote studio in... Yorkshire. This is a job I voiced for Biffa. A fun viral to promote the Waste Eaters. An awesome voice session with a great director who knew exactly what he wanted. I'm really proud of how it turned out. Deep in the depths of... Strictly. It's always fun to work with the team on Strictly Come Dancing on BBC 1 in the UK. So this was a pleasure to be part of. This particular year, contestant Ainsley Harriet had to go to London Zoo for one of the sequences and of course, they needed... an Attenborough voice. As you can see, a voice for any format, as heard on hit TV shows too. How to book your Voiceover? I'm available daily and pride myself on a fast same day delivery. The mating call to acquire my service is a simple ‘ROAR!’. If that doesn't work, then do email. Need it quickly? Pick up the phone and ‘squawk’ to me direct! A professional male voiceover delivering a professional voice over.